Key reports on judges by crusading Judicial investigator removed from public view. 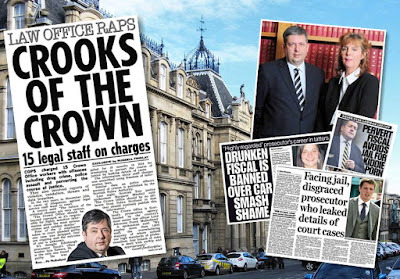 GROUND BREAKING reports written by a trailblazing Judicial investigator on the inner workings of the Judiciary of Scotland have been removed from public view by the Scottish Government - in an apparent bid to wipe evidence of the lack of accountability of Scotland’s elite, secretive and all-powerful judiciary. 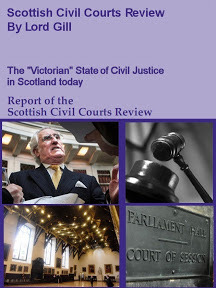 The three hard hitting reports – authored by Moi Ali - Scotland’s first ever Judicial Complaints Reviewer (JCR) are no longer available on the JCR’s website after they were removed by the Scottish Government - who control the website. 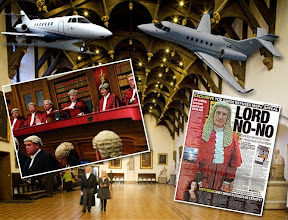 The key reports cover the years 2011-2014 - when Lord Arthur Hamilton, and subsequently Lord Brian Gill - served as Lord President & Lord Justice General. 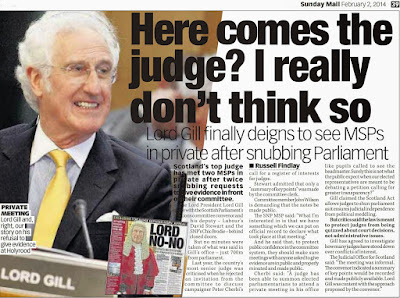 Gill (75) - who was Lord Justice Clerk in 2011, succeeded Lord Hamilton to the top judicial post in June 2012. 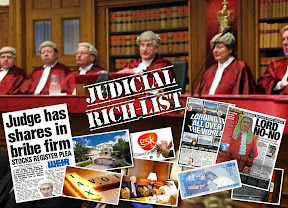 The ground-breaking insight into Scotland’s judiciary also formed part of evidence submitted to a Scottish Parliament investigation into proposals to create a Register of Interests for Scotland’s Judiciary: Petition PE1458: Register of Interests for members of Scotland's judiciary. 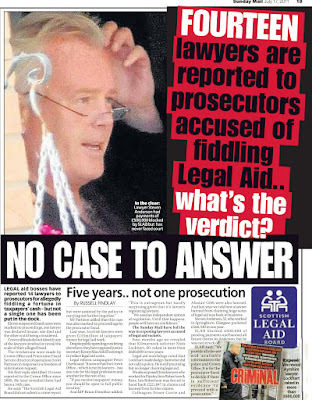 The disappearance of the three highly acclaimed and critical reports on heavy handed secretive Scottish judges was revealed in an investigation this week by the Sunday Herald newspaper. 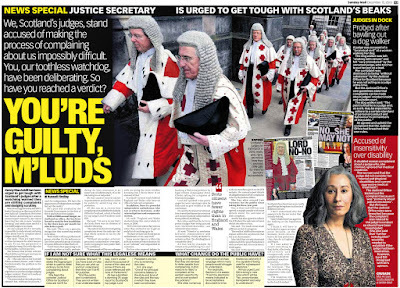 The Sunday Herald investigation also revealed Gillian Thompson OBE – who took over the role of Judicial Complaints Reviewer from Moi Ali in late 2014 - has not produced an annual report in the two years since she was appointed to the post. 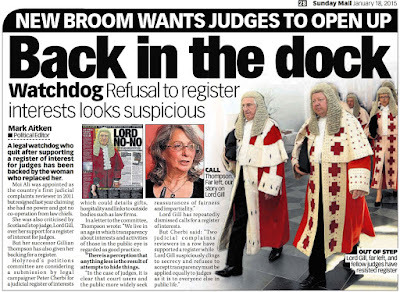 Gillian Thompson is known to support calls to create a register of interests for judges. 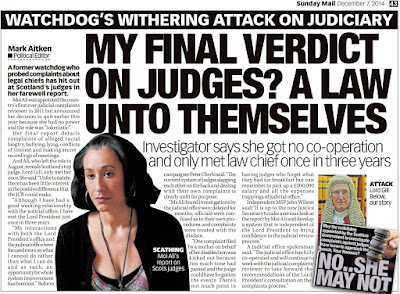 During the summer of 2015, Ms Thompson appeared before the Public Petitions Committee and fully backed proposals to require judges to declare their interests. 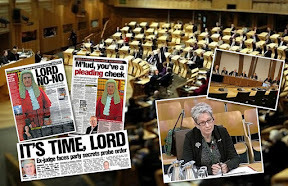 A full report and video footage of Gillian Thompson’s evidence to the Scottish Parliament and her support for a register of judicial interests can be found here: Judicial watchdog tells MSPs - Judges should declare their interests in public register. However, little has been heard from the JCR since Ms Thompson's 2015 Holyrood appearance and the Sunday Herald article states the current JCR “could not be reached”. And the lack of an annual JCR report since 2015 comes despite a Ministerial Directive to the JCR to produce an annual report which former JCR Moi Ali described as “an important form of public accountability”. Serving as Judicial Complaints Reviewer, Moi Ali appeared before the Public Petitions Committee of the Scottish Parliament in a hard hitting evidence session during September of 2013. 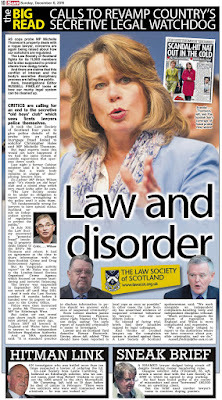 Ms Ali gave a full account of her role as Judicial investigator to MSPs, and went on to describe oversight of Scottish judges as “Window Dressing”. 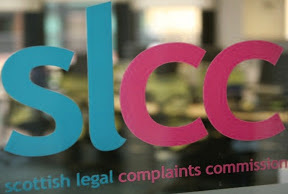 At the hearing, Ms Ali also backed proposals before the Scottish Parliament calling for the creation of a register of judicial interests.– reported here: Judicial Complaints Reviewer tells MSPs judges should register their interests like others in public life. 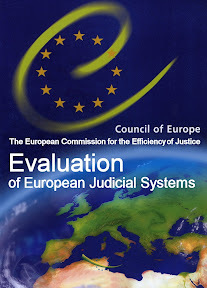 Writing in a further letter to the Public Petitions Committee Judicial Complaints Reviewer Moi Ali told MSPs of the “incredibly powerful” nature of the judiciary and why a register of judicial interests would help judicial transparency and public confidence in the justice system. 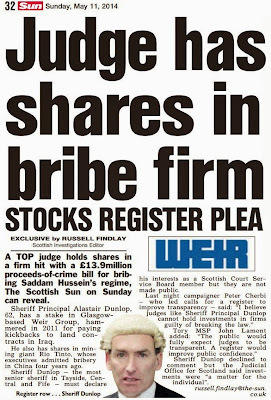 If the judicial transparency proposal becomes reality, all members of Scotland’s judiciary - instead of just the elite few who sit on the board of the Scottish Courts - will be required to declare their vast and varied interests including their backgrounds, personal wealth, undeclared earnings, business & family connections inside & outside of the legal profession, membership of organisations, property and land interests, offshore investments, hospitality, details on recusals and other information routinely lodged in registers of interest across all walks of public life in the UK and around the world. The Scottish Parliament’s Petitions Committee is due to hear Petition PE1458 on Thursday 29 September 2016. A submission from the petitioner to MSPs asks the Committee to invite Professor Alan Paterson to give evidence in a public session. 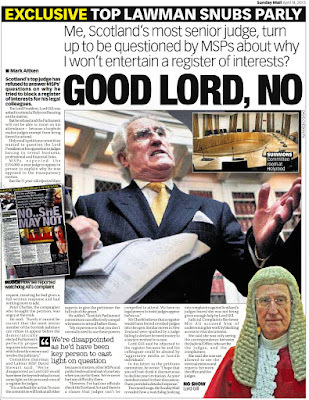 Writing in evidence to MSPs earlier this year, Professor Patterson heavily criticised the “Recusal Register” – which was set up by Lord Gill as a result of a private meeting with MSPs in a bid to head off the intense probe by MSPs into judicial interests and transparency. 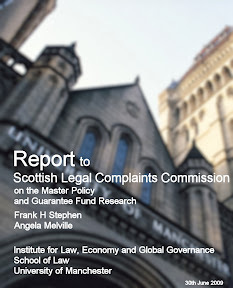 A full report on Professor Patterson’s written evidence to MSPs can be found here: Law Professor - room for widening transparency to include more than pecuniary interests, current recusals register is not complete. 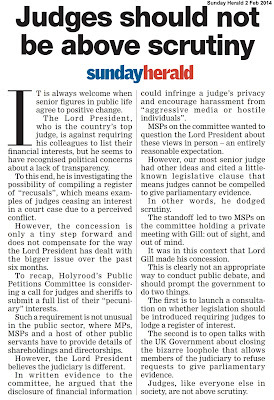 MSPs have also received a request to take forward earlier recommendations to invite the new Lord President – Lord Carloway – to appear before the Public Petitions Committee and face questions on his opposition to judicial transparency and declarations of judicial interests. 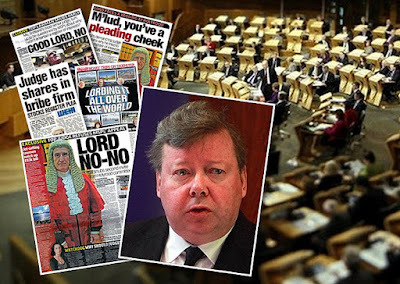 Lord Carloway is known to oppose opening up a register of judicial interests. 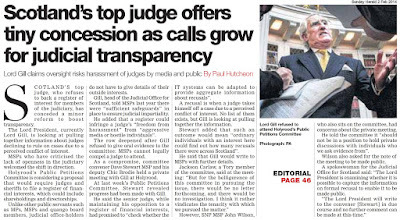 In an earlier letter to MSPs, the latest in a long line of Lord Presidents blasted calls for judicial transparency. 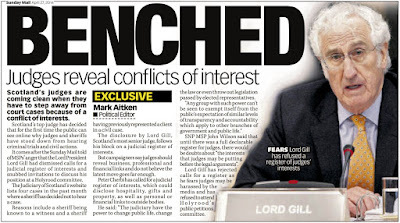 The top judge – who succeeded Brian Gill as Lord President - claimed in a letter to the Petitions Committee that justice could be brought to a halt if judges were forced to declare their wealth and interests. 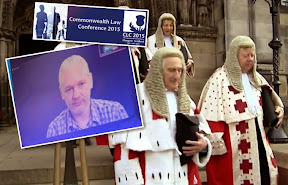 A suggestion has also been passed to MSPs to contact current JCR Gillian Thompson to establish if there are any further views she wishes to put forward in terms of support for the petition already given by Ms Thompson during an evidence session held at the Scottish Parliament during June 2015. 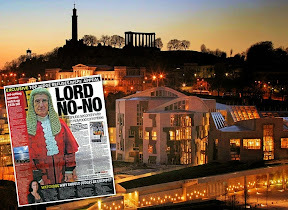 Too big a dose of the truth for Lord Presidente and friends to stomach.Proves once more we need your register of interests and someone in the JCR role who can stand up to judges AND the Scottish Government. Very good and decency to publish. 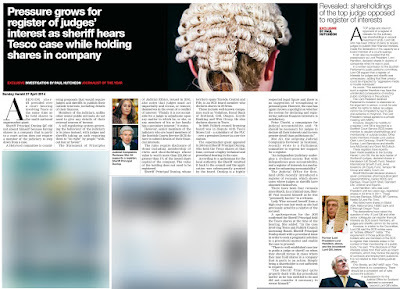 A JUDICIAL watchdog has failed to publish an annual report of her time in the high-profile post – more than two years after getting the job. 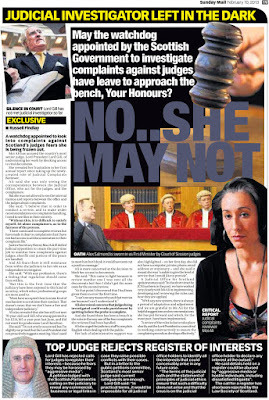 Gillian Thompson, the Judicial Complaints Reviewer (JCR), had been expected to produce an official account of how she had scrutinised complaints against sheriffs and judges. Her predecessor, Moi Ali, said yesterday she believed publishing an annual report was a “requirement” of the job. 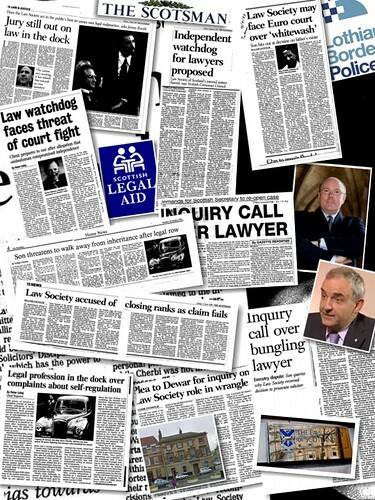 The JCR post was created by the Parliament to give members of the public a way of querying decisions by the judiciary. Complaints are investigated internally by the judiciary, but the JCR can examine whether a probe was handled correctly. Ali was a trailblazer in the role and clashed with the former Lord President of the Court of Session about the powers of the JCR. In the end, although she claimed that the role amounted to “window dressing”, she secured a Ministerial direction that allowed her to submit an annual report about her investigations. In these reports, she shone a light on the judiciary and revealed she had upheld a number of complaints. Ali stood down in 2014 and was replaced later that year by Gillian Thompson OBE, a former civil servant. Despite being in post since then, the JCR website contains no publications explaining the work she has carried out. 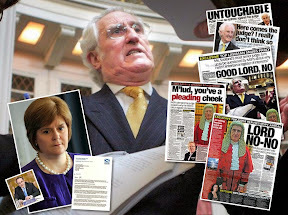 Earlier this year, she wrote that an annual report was at final draft stage and ready to send to Scottish Ministers and the Lord President, Lord Carloway, for observations. She estimated that publication would be before the end of February. It is also emerged that Ali’s three annual reports – covering 2011 to 2014 – can no longer be downloaded on the JCR website. Ali told this newspaper: “I felt publishing an annual report was a requirement of the role. It’s about letting the public know what you have been doing and holding the judiciary to account. A Government source said there was "no time requirement" for JCR reports and Ministers are expecting an update report soon. 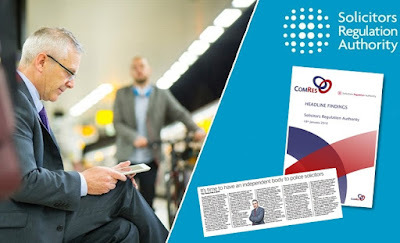 Scottish Conservative deputy leader Jackson Carlaw said: “With no annual report for two years, there seems to be a major discrepancy in what was agreed and what is being delivered. 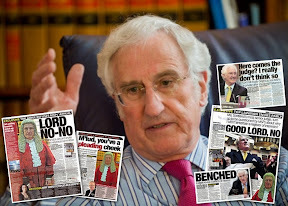 Liam McArthur, the Liberal Democrat justice spokesman, said: "Moi Ali quit as the Judicial Complaints Reviewer after warning that that the role was little more than window dressing. The Justice Secretary of the time asked her to do a job and then failed to give her the powers and resources that she needed. 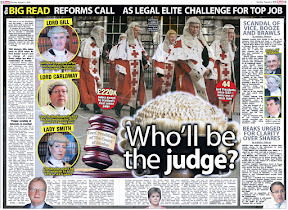 "We need a judicial watchdog with teeth who can ensure that problems are dealt with quickly and transparently. Moi Ali spoke out when she felt that she was not getting the support she required. Gillian Thompson should not be afraid to do the same." Thompson could not be reached. 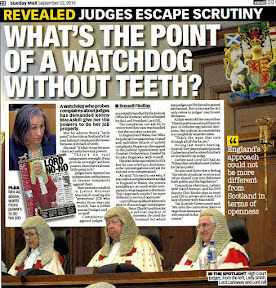 The judiciary appear to be hellbent on destroying whatever reputation remains of their "world respected legal system"
Obviously a link.Carloway and Gill must have been up in arms over Gillian Thompson's comments about registering their interests. 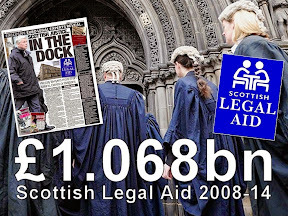 Why is this still on the go?I did not vote for the Scottish Parliament to ask permission of judges before they make a law!If this is the case why bother having the Scottish Parliament! 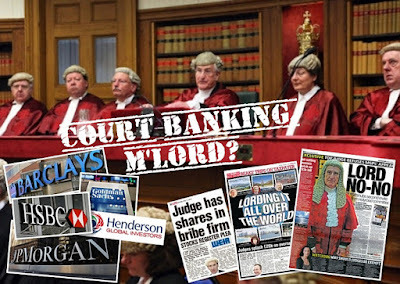 Make the register law and judges have to declare their interests like everyone else and stop asking judges and lawyers permission to make the law!Voters dont vote for lawyers they vote for politicians!Bloody do something about it and make proper law! On the news they keep talking about Hillary Clinton not releasing her emails and Donald Trump not publishing his tax returns but if either of them acted so arrogantly an deviously up front and refusing to appear to be questioned as your judges did neither would even be a candidate for President in the election! My advice you scots really need to get moving on declaring the judges they are not your masters!do not treat them like they are! 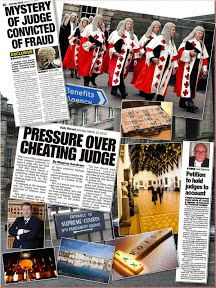 3 years not long enough for the judiciary to hide their money in the Caymans?Come on Scottish MSPs stand up to these old duffers! You don't have permission to access /sites/default/files/publications/annual-report-2013-14.pdf on this server. You don't have permission to access /sites/default/files/publications/Annual Report 2012-13.pdf on this server. You don't have permission to access /sites/default/files/publications/460350_v4_20130128_0.pdf on this server. The headline says it all. 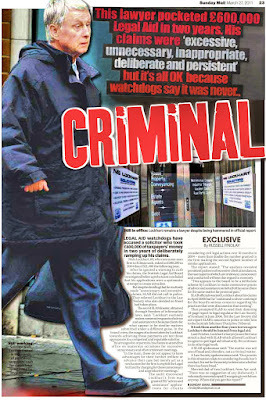 The Scottish Government are therefore criminals and are not fit to govern. 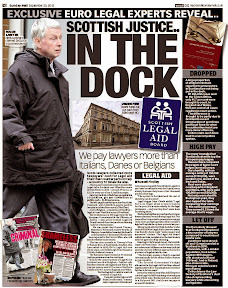 We have strong links between a corrupt government, lawyers and judges who are simply one mendacious unit. So our elected representatives are malevolent towards the constituents who voted for them. Why am I not surprised. Politicians make me sick and so reviled that rightly or wrongly I stopped voting two years ago. 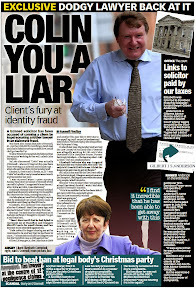 For anyone who gets shafted by a Scottish lawyer don't write to your MSP. 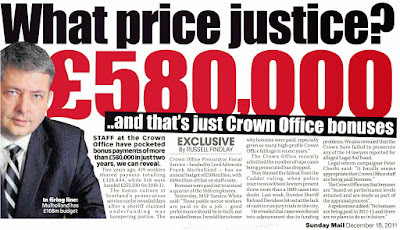 Shame on you Miss Sturgeon and shame on all MSP's who are a disgrace to the people of this country. I cannot find strong enough words in the English language to describe how you all revile me. Yes Miss Ali highlighted the truth and they want to hide it. Disgusting politicians I worship the ground that awaits you. 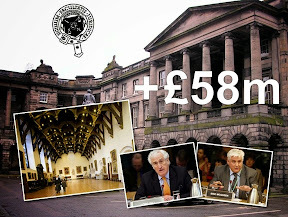 Fk Scottish politicians a faction of rats. Fantastic report as always Peter!A real treat to read your detail laden posts! If only Court of Session opinions carried such weighty references and evidence instead of some judge scribbling words to the effect because A did to B in the year 1066 we find the same must be true today! 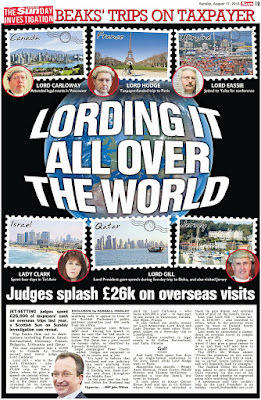 Surely a little strange judges do not register their interests? After reading your blog I can imagine cases routinely suffer when a judge has links to either or both sides of the court and no one need say anything.Horrid thought I know but with no register there is nothing to prove honesty. 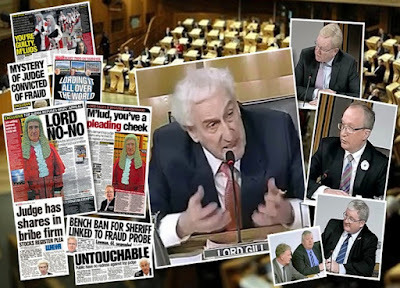 No use comparing Scottish judges like Lord Gill and Carloway to Clinton and Trump because at least Clinton and Trump show up for debates unlike Scottish judges who f* off to Qatar and everywhere else to fill their boots then refuse to go to parliament it was in all the papers and discussed by msps and Cherbi covers it on the blog plenty and in the links. Well written by Moi Ali congratulations Ms Ali if you are reading this blog you are a fine person and stand up for what is right!We need more like you! !Well done!! I just find it incredible that judges do not register their interests and are resisting the proposal so much there must be something they are hiding.This is what they would say to us if we did not answer questions in court or register what we have if they order us to so same law must apply to them! 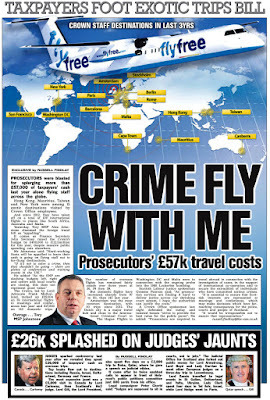 If any further proof of dishonesty in Scotland's judiciary were needed this must be it.And by removing the annual reports of Moi Ali this has now become news. So they set up the office of judicial investigator Miss Ali does her job and then resigns. They don't like her findings and then those who set up the office of judicial investigator cover her reports up. What a bent parliament we paid for. I think MSP's are the real crooks in this because they are like the Law Society. I knew they would bury the truth. Utter scum they are. 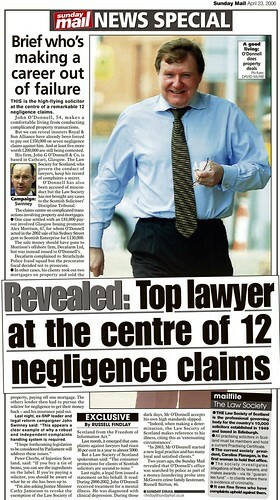 Now people know there is no point complaining to their MSP's about crooked lawyers. 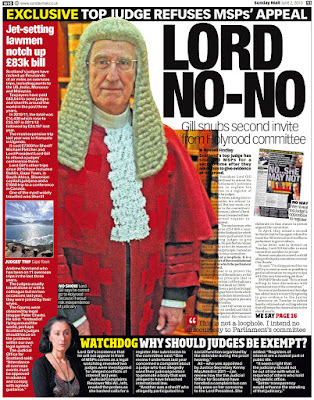 MSP's Judges, Lawyers, all against the Scottish public. 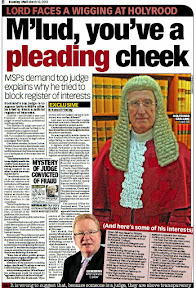 It is an outrage especially those MSP's who are quislings by supporting our judicial enemies. The answer lies in the following question. Do criminals, tax avoiders and corrupt public servants register all their assets? Only people with something to hide fail to declare. As they say to us nothing to fear nothing to hide! I take my hat off to Ms. Ali, a dedicated and honest civil servant who demonstrated an exemplary commitment to transparency and openness - obviously she could not be allowed to stay and so her position was underfunded and sidelined. No doubt much the same can be said of the position Ms. Thompson finds herself in and the message is clear, the SNP - and every other major political party in Scotland for that matter - do not wish the Scottish Public to have access to an honest and transparent legal process. This reminds me of the occasion when keenly awaited records listing sectarian offenses in Scotland were 'accidentally' destroyed. Purely coincidentally records had allegedly confirmed that the main offenders were found not at football matches but by those taking part in Orange Lodge marches. The obvious question now is why has the new JCR not said anything about this removal of her predecessor's annual reports? You cant hold a post like this and not hold an opinion on why Moi Ali's reports were removed. Will the same happen to any reports written by Gillian Thompson?Removed because content not agreed to by the judiciary and Scottish Government? 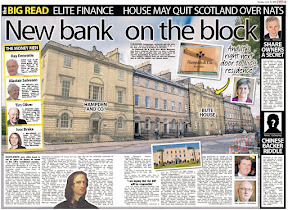 Not only JCR reports.If you look around what were once regarded as independent public bodies you will see a lot of their history rewritten or deleted.As others have already written part of a wider trend of the current Scottish Govt to put their own spin on daily life. Strange how people are meant to be equal before the law when a historically secret group can get away with all manner of injustices against the public. Miss Ali discovered the truth and they did what I expected, cover it all up. Damn all of you MSP's, and they wonder why people develop apathy to politicians. 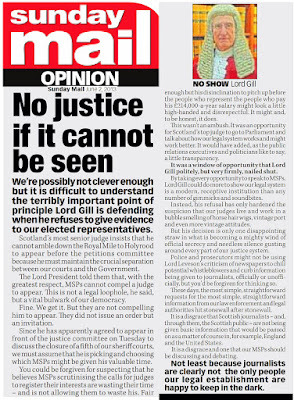 If all politicians have the same attitude on one issue then their voters have no power (apart from trying to highlight the issue) but clearly the Judges control MSP's so the latter are not fit to hold the positions they do. These people are simply rotten and it annoys me that they have these meetings when they have no intention of changing anything. Politicians are a waste of space. How do they get away with it so up front delete everything and now the new JCR is unreachable!Keep investigating! 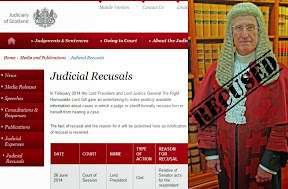 This may sound cheeky but should the Lord President not be insisting these reports are published?After all Moi Ali's fine work as JCR this is now part of the history of the Scottish judiciary just like your petition and cannot be allowed to be wiped from public record. Well I assume so as I read the post about the new judicial reviewer supporting the petition so only a matter of time before she is written out of history as well. As any right thinking individual will ask in whose interest is it to keep all these financial arrangements a secret. Mr Sutherland I find it incredulous that you refer to an individual judge being subjected to misconceived criticism when they reality is that you judges can basically within reason do what you want making decisions that deeply affect people's lives with no accountability. As for your predecessor he goes on about judicial oaths, which are worthless. I will tell you judges what is tangible. Your omnipotence is a direct result of your secret financial arrangements and it is clear that the administration of justice is mutually exclusive with the secrecy of the judiciary. Who benefits from this secrecy here and now. 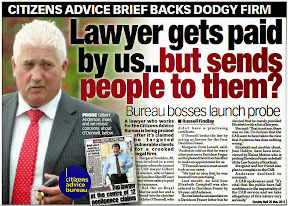 Lawyers judges and their unions. It is simply an outrage that in 2016 we have these arrangements. The Crown Office don't do accidental or coincidence. The statistics relating to sectarianism within the justice system were deliberately destroyed to avoid a Justice Committee probe. 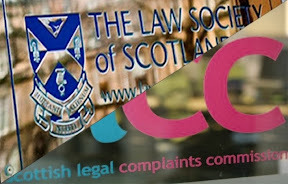 As of this morning, Friday 30th September the three annual reports published by Scotland's first Judicial Complaints Reviewer - Moi Ali - are now available again on the Judicial Complaints Reviewer's website here http://www.judicialcomplaintsreviewer.org.uk/ by clicking on "Publications".